Welcome to the Wholesale section of our website specifically designed to enable wholesale/trade customers to process multi-part orders with minimal fuss. 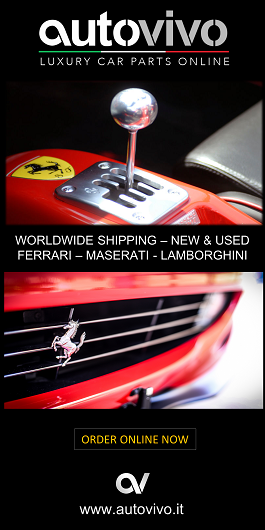 We supply car parts for Italian luxury car brands -Ferrari - Maserati - Lamborghini and ship worldwide in most countries with very reliable courier and freight forwarders and also happy to use your provider for the shipment of goods to ensure that your orders are handled with care and delivered on time. There are two ways in which you can place a large order- firstly by uploading a document, image or spreadsheet with the entire list of all your part names/numbers included, or by inquiring directly with us. Either way, we will process your order in the quickest possible time and an Account Manager will contact you once we have a confirmed price and shipping time. Our sales team is available to you round the clock, providing you with the best possible service and competitive prices. So, whether you are a crash repair workshop in the Far East, a service centre in the U.S, a bodyshop in the UK or insurance company in South Africa - we are pleased to service your demand, however large the order.